Attending an office party or another work-related social event can be tricky. You want to have fun with your coworkers while never forgetting that it's a workplace event. These tips will help you have a good time without checking your professional reputation at the door. If your employer is serving alcohol at an event, should you partake? You can, but limit your intake. Alcohol lowers your inhibitions and alters your judgment. The last place you want to be while uninhibited and lacking good judgment is an event hosted by your boss and attended by him or her, and your colleagues. Your actions under those conditions could cause you to become the subject of workplace gossip or worse, unemployed. Know your limits and don't go beyond them. One alcoholic beverage—or even two if you are sure you can handle it—is okay. Although you may know a third drink won't be a problem for you, keep in mind perception is everything. You want to avoid looking like you are drinking too much. You may know little about your colleagues other than what their jobs are. An office party gives you a chance to become acquainted with them on a whole other level. Getting to see them in a different environment may make you look at them differently, and Jim (or Jane) from accounting may suddenly look a lot more appealing under bar lights than cubicle lights. Ignore your animal instincts. Workplace romances—or worse, one night stands—can be disastrous. Don't think about flirting with coworkers, even if it's entirely innocent (if it isn't, please reread Tip #2). The message it sends to your colleagues isn't. Flirting or acting in a sexually provocative manner can, at best, make colleagues lose respect for you on a professional level. At worst it can end with a claim of sexual harassment against you. Party clothes are perfectly acceptable—and probably even expected—for the office party. So go ahead and toss aside your usual work attire and wear something festive. Sparkles, bright colors, and sequins are appropriate, but it is crucial that you maintain the same respectability as for a typical day at work. Don't show too much skin or wear anything see-through or form-fitting. It is okay to relax and have fun. It's a party after all. But don't lose sight of the fact that you are still at work, even if the setting is different than the one you are in daily. Your boss is watching. Your coworkers are too. Don't show a side of yourself that could be embarrassing or cause their opinion of you to change for the worse. For example, don't share too much personal information if you wouldn't want it to be known in a professional setting. Office parties are usually light-hearted events. Feel free to tell jokes, as long as you are sure they won't offend your coworkers or boss (or worse, his or her boss). Many people do not enjoy off-color jokes, so refrain from telling any. On a related note, you should also be wary of using foul language. 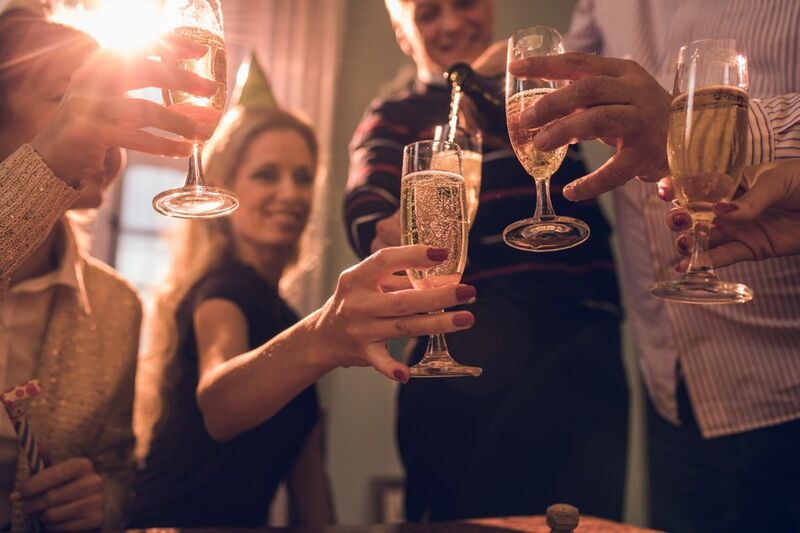 Employers throw parties to reward their workers and give them time to socialize with each other. How can you take advantage of this opportunity if you are constantly checking your phone? Put it away and try to focus on the here and now. If you must check your phone occasionally, slip away to do so. Of course, keep your phone handy for taking pictures! Share them on social media later. Whether on the job or at a work-related event, it is in poor taste to gossip. You may run out of things to discuss with your colleagues so you decide to fill the silence by talking about those people who couldn't attend the festivities. If the fact that it's just not a nice thing to do doesn't deter you, think about how you will feel if word gets back to him or her. When your boss throws an office party, he or she may intend it to be for employees only. Never assume it's okay to bring your significant other or anyone else without asking first. Showing up at an event with a plus-one may anger your boss and embarrass your guest if he or she feels unwanted. If your invitation includes a guest, choose wisely when deciding who to ask. Avoid bringing someone who might exhibit inappropriate behavior—even if he or she is your significant other. Your plus-one's bad behavior will reflect poorly on you. If you deem it necessary, remind your guest to follow the same rules to which you are expected to adhere. Somebody's Watching You! Is It Your Boss?